Amniotes fall into three main groups: the synapsids, the diapsids, and the anapsids (see p. 112). 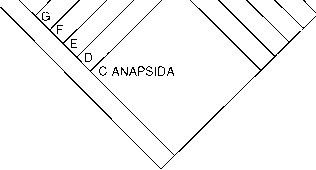 The Anapsida and Diapsida are broadly sister groups, forming the clade Sauropsida, and Synapsida is the outgroup. It has taken some time, however, to make sense of the relationships within each of these three major groups, and of the early anapsids in particular. At first, attempts were made to group Protorothyrididae and Captorhinidae together (e.g. Romer, 1966; Carroll, 1987), but these two families share only primitive characters. Indeed, the family 'Protorothyrididae', containing the oldest amniotes, Hy-lonomus and Paleothyris (see pp. 107-11), turns out to be a polyphyletic assortment of small anapsids, some such as Pale-othyris lying close to the diapsid line, and others occupying a variety of basal positions in the cladogram. Gauthier etal. 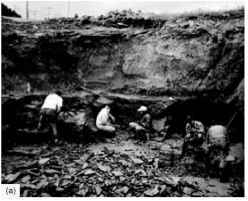 (1988a) discovered that most of the Permian anapsid groups formed a clade they termed 'Parareptilia', a view generally confirmed subsequently. Lee (1995) and Laurin and Reisz (1995) found that the parareptiles were outgroups of Testudines, the turtles, and together they form a larger clade Anapsida. But what are the closest relatives of turtles among the Permian anapsids, pareaisaurs (Lee, 1995) or procolophonids (Laurin and Reisz, 1995)? The former view is accepted here (see cladogram). More distant outgroups of turtles are bolosaurids, millerettids and mesosaurids (Modesto, 1999; Berman etal., 2000a). The relationships of the diapsids seem a little clearer. Captorhinids and Paleothyris appear to be outgroups of Diapsida. The weigeltisaurids are primitive in many respects and form an outgroup to the Younginiformes and Protorosaurus (Benton, 1985; Laurin, 1991). The diapsids of the Late Permian include two lineages that rose to importance later, one, the Archosauromor-pha, leading to the dinosaurs, crocodilians and birds, and the other, the Lepidosauromorpha, to the lizards and snakes (see p. 150). Rieppel, 1997) that morphological evidence supports the placement of turtles among the diapsids, although this time in the lepidosauromorph clade. Morphological support for this arrangement is, however, weak (Wilkinson et a/., 1997). Rieppel (2000b) has found very little morphological support for the molecular pairing of turtles and archosaurs. Lee et al. (in press) argue that both data sets are suspect: the morphological data contain a great deal of homoplasy and secondary signals push turtles artificially close to lepidosauromorphs, whereas high rates of molecular evolution in squamates push them too low in the tree, hence artificially pairing turtles and archosaurs. This clash of molecular and morphological data has yet to be resolved and explained: only one result can be correct and one data set then is giving a misleading and false signal. Cladogram showing the postulated relationships of the major groups of amniotes, based on Laurin and Reisz (1995), Lee (1995) and Modesto (1999). See Box 4.5 for context of Amniota; see Box 5.3 for relationships of Synapsida and Figure 6.6 for relationships of Neodiapsida. Synapomorphies: A AMNIOTA, frontal contacts orbit, rounded occipital condyle, three ossifications in scapulocoracoid, astragalus; B SAUROPSIDA, maxilla separated from quadratojugal by jugal, tabular small or absent, parasphenoid wings absent, supraoccipital narrow in posterior view, large post-temporal fenestra, suborbital foramen in palate, single coronoid, femoral shaft long and slender, single centrale in ankle; C ANAPSIDA, caniniform maxillary tooth absent, caudal haemal arches attached to anterior centrum, supraglenoid foramen absent, femoral shaft long and slender; D PARAREPTILIA/E, large lateral foramen on maxilla, quadratojugal expanded dorsally, temporal emargination bordered by quadratojugal and squamosal, jaw articulation in front of occiput, ectopterygoid small and lacks teeth, ectepicondylar groove and foramen in humerus, iliac blade expanded dorsally; F PROCOLOPHONIA, enlarged quadratojugal, pineal foramen near fronto-parietal suture, tabular absent, sacral ribs with narrow distal contact, T-shaped interclavicle, astragalus and calcaneum sutured or fused, fifth distal tarsal absent, dorsal dermal ossifications; G, massive horizontal paroccipital process fused to squamosal, fused basioccipital and basisphenoid, palate raised above margin of maxilla, 22 or fewer presacral vertebrae, long straight lateral processes on caudal vertebrae, dorsal buttress over acetabulum, reduced phalangeal formula of hand, astragalus and calcaneum fused, short slender fifth digit in foot, reduced phalangeal formula of foot, heavy dorsal dermal armour; H, postorbital does not reach supratemporal, supratemporal small, caniniform maxillary tooth, quadrate anterior process is short; I, tabular separate from opisthotic, ventral keel on anterior vertebral centra, carpus and tarsus long and slender, metatarsals and metacarpals overlap; J DIAPSIDA, upper and lower temporal fenestrae, suborbital fenestra, ossified sternum, complex tibio-astragalar joint, first metatarsal less than half the length of the fourth metatarsal; K, lacrimal reduced, caniniform maxillary teeth absent, quadratojugal reduced; L NEODIAPSIDA, anterior process of squamosal narrow, trunk ribs mostly single-headed, ends of humerus robust. The basal anapsids include animals such as Hylonomus and Paleothyris (Figures 5.1-5.3) and six other genera from the Upper Carboniferous and Lower Permian of North America and Czechoslovakia that have been assigned to the Protorothyrididae (Carroll and Baird, 1972; Clark and Carroll, 1973). The 'protorothyridids' were agile insectivores, rather like modern lizards in their ecology. It was once thought that the protorothyridids were a highly conservative family, a group that had evolved little during its 30 Myr history. Cladistic studies indicate, however, that the family is paraphyletic, defined only by primitive characters, and the various pro-torothyridid genera are in fact basal members of all three major amniote lineages (Laurin and Reisz, 1995). Mesosaurs (Modesto, 1999) are the first-known fully aquatic amniotes, represented by abundant small skeletons, up to 1m long, from the Lower Permian of South America and South Africa, areas that were in contact at the time. They were used by Alfred Wegener as key evidence for the existence of Gondwana (see p. 25). The body(Figure 5.6(a)) is elongate, with a long neck and an especially long flat-sided tail that was used in swimming. The long thin jaws are lined with needle-like teeth that intermesh as the jaws close. They provide a kind of straining device that allowed Mesosaurus to take a mouthful of small arthropods or fish and strain the water out before swallowing. 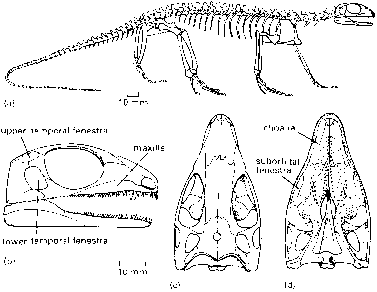 The millerettids from the Upper Permian of South Africa show some superficially lizard-like features in the skull (Figure 5.6(b, c)). There is usually a temporal fen-estra, but its lower bar is often incomplete, and the squamosal, quadrate and quadratojugal may have been mobile. Millerosaurus was a small active insectivore with a 50 mm skull, and it probably lived rather like a modern lizard. Rich new tetrapod localities are not often discovered in Europe because so much collecting has already been done over the past two centuries. But a chance discovery in the 1980s by Thomas Martens, a palaeontologist at the Museum der Natur Gotha, has revealed a rich assemblage of basal tetrapods and amniotes. Martens, working in what was then East Germany, had little contact at first with the west, but then made connections with palaeontologists in North America after the Berlin wall came down (see illustration (a)). The fossils come from the Tambach Formation, a sequence of conglomerates, sandstones and mudstones 200-400 m thick, deposited in a small, internally drained basin. The sediments were deposited on an alluvial plain with minor stream channels, and the climate showed seasonal wet-dry cycles of a savanna type climate. This upland type of setting is unusual, and none of the fishes and aquatic tetrapods that are typical elsewhere have been found here. 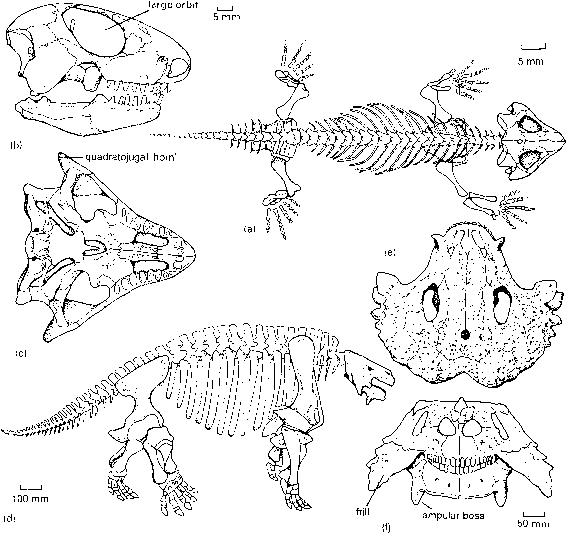 The fauna identified so far (Berman et al., 2000a, b) consists of Tambachia, a trematopid temnospondyl, adult Seymouria, a Diadectes-like reptiliomorph (see p. 101), the bolosaurid diapsid Eudibamus (Figure 5.9), a captorhinomorph reptile, Thuringothyris, and the sphenacodont Dimetrodon. Yet to be described are a small dissorophid, a caseid and a varanopid. The dominance by large herbivores and the absence of aquatic species suggest that the Bromacker assemblage may represent one of the first terrestrial vertebrate ecosystems. Many of the fossils are nearly complete with very little abrasion, and they are probably preserved at or very close to their site of death (see illustration (b)). But, because of the friable nature of the shales and fine sandstones in which they are preserved, preparation of the delicate fossils can take a long time. These give more information, and illustrations of the site and some of the fossils. moving at high speed (Figure 5.7). The tail is as long as the body, and was probably used for balancing. Bolosaurids have bulbous teeth that occlude—that is, they meet on distinct facets—indicating a diet perhaps of tough plants. Despite their unusually advanced locomotion,bolosaurids were never more than a rare group, and did not outlive the Permian. The procolophonids arose in the Late Permian and lived for about 50Myr to the end of the Triassic, becoming rather diverse in the Triassic (Spencer and Benton, 2000; Sues et al., 2000). 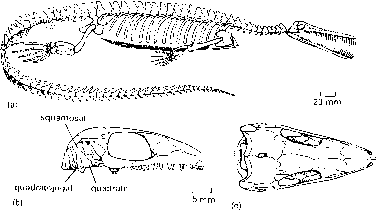 Procolophon from the Lower Triassic of South Africa and Antarctica (Carroll and Lindsay, 1985; deBraga, 2003) is 300-400mm long and has a stocky body and a relatively large broad skull (Figure 5.8(a-c)). The large orbits include a posterior portion that was associated with the jaw adductor muscles, and the quadratojugal is expanded into a 'horn'. Later procolophonids often had several horn-like projections on the quadratojugal, possible defensive struc tures. The cheek teeth are blunt and peg-like, present only in small numbers, and they meet during occlusion. They suggest a diet of fibrous plant material, and possibly arthropods with tough cuticles. The broad paddlelike feet suggest that procolophonids might have been burrowers (deBraga, 2003). The pareiasaurs (Lee, 2000) are restricted in time to the Late Permian. Most are large, typically 2-3 m long and heavily built. The Russian Scutosaurus (Figure 5.8(d-f)) has massive elephantine limbs with short feet, and a muscle 'hump' over the shoulders associated with massive neck muscles. The skull is broad and heavy and covered with thickened knobs and incized sculpture, and a broad lateral frill that descends below the jaw line. The angular bone of the lower jaw is expanded to form a ventral boss. The teeth suggest that pareiasaurs were plant-eaters that fed on soft vegetation. In recent debates, pareiasaurs and procolophonids have been proposed as a sister group of the turtles (see Box 5.1). the dentition. The peg-like teeth are often present in multiple rows (Figure 5.9(b, c)) that seem to slope diagonally across the width of the jaw, and five or six rows may be distinguished in one jaw bone. Ricqles and Bolt (1983) argued that the teeth of cap-torhinids were budded off from a dental lamina, the gum tissue which produces teeth, that lay medially. As the animal grew in size, the maxilla added bony tissue plus teeth from the inside, and bone was removed and teeth worn on the outside. Thus, over time, the inner teeth in each row will come into wear at the jaw edge as older teeth are lost. This complex system of tooth replacement is interpreted as an adaptation for piercing or grinding tough plant material or hard-shelled invertebrates. Diapsids are rare in the Carboniferous, being known from only two taxa from the Upper Carboniferous of Kansas, USA. One of these, Spinoaequalis, was possibly aquatic and the other,Petrolacosaurus (Reisz, 1981), retained terrestrial adaptations. Petrolacosaurus,a slender 400-mm-long animal, has a body (Figure 5.10(a)) similar in proportions to Hylonomus, but with a relatively smaller head, less than one-fifth of the body length, a longer neck and longer limbs. The skull (Figure 5.10(b-d)) is also similar, but with larger orbits, two temporal fenestrae, and more small teeth on the palatal bones. The teeth are small and sharp and clearly indicate a diet of insects and other small animals. In addition to the choana, or internal nostril, of all tetrapods, through which the air passages from the nasal cavity pass into the mouth, there is an extra opening in the palate, the suborbital fenestra (Figure 5.10(d)). The diapsids remained at low diversity during the Early Permian, and radiated in the Late Permian. The most unusual were the gliding weigeltisaurids of Europe and Madagascar (Evans and Haubold, 1987). These small animals have elongated bony rod-like ribs that stick out sideways forming horizontal 'wings' (Figure 5.11(a)), but could be folded back when the animal was running about. The ribs were presumably covered with skin, and Coelurosauravus could have glided from tree to tree as the living lizard Draco does. 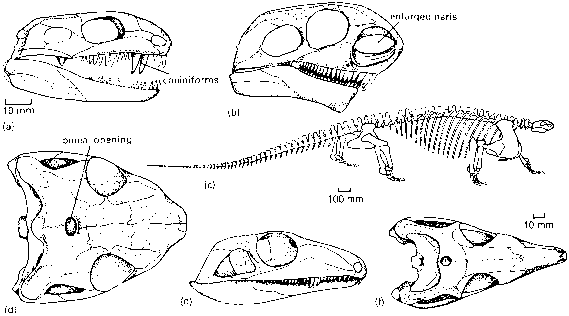 The skull (Figure 5.11(b)) is diapsid (the lower temporal bar is incomplete), and the squamosal and supratemporal have striking 'toothed' margins at the back. The other Late Permian diapsids were less exotic. They include forms such as Protorosaurus (Figure 5.11(c)), a slender long-necked animal from the Upper Permian of Germany, the first representative of the Archosauromorpha (see p. 138). Youngina (Figure 5.11(d)), only 350-400mm long, was probably an active lizard-like insectivore and carnivore (Gow, 1975). The skull is similar to that of Petrolacosaurus (cf. Figure 5.10), but with rather larger temporal fenestrae. The neck is short and the limbs are long. Youngina is part of a wider clade Younginiformes that includes other Late Permian and Early Triassic terrestrial and aquatic relatives, some of the latter with deep flattened tails and paddle-like feet.